HM 665 with Control C.2 - Hose crimper, hydraulic crimper, Workshop crimpers, Production crimper : UNIFLEX of America LLC. 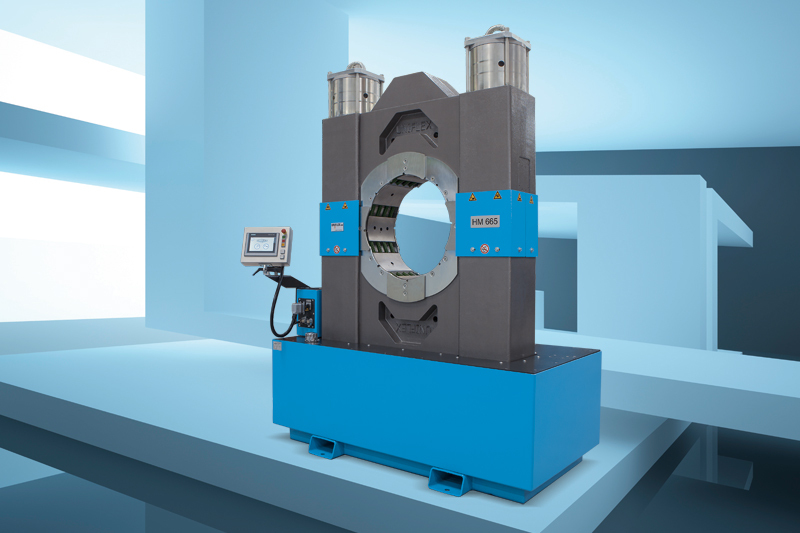 The innovative HM crimpers from UNIFLEX are setting new standards. The HM 665 is a perfect example here, combining high productivity and quality with outstanding ergonomics and a long service life. The machine offers an opening stroke of more than 180 mm and an opening diameter of 580 mm (without dies). It can thus be used to crimp industrial hoses up to 12" with ANSI flanges and pipe fittings up to 16" without having to remove the dies. The fixed 6-o'clock die and the 250 mm long bottom die make workpiece positioning easy. Apart from hydraulic hoses, the machine can be used to join reinforcing steel, steel cables, ropes and insulators with forces up to 6000 kN. The HM 665 is controlled through the tried and tested Control C.2, a bespoke control unit of UNIFLEX.